Over 200 Bernie supporters from labor rallied at the Seattle Labor Temple in late February, including some of the hardest fighting leaders from local unions. On stage was Larry Cohen, former International President, CWA, which has endorsed Bernie Sanders following three months of democratic debate within the union, Seattle City Councilmember Kshama Sawant of AFT, Claude Burfect of Coalition of Black Trade Unionists, Joel Funfar of SPEEA/IFPTE, Jonathan Knapp of SEA, Angela Marshall of IBEW, WA YELL & WSLC, Terri Mast IBU/ILWU, Paul Bigman of KCLC, David Parsons of the UAW, & Myrna Umali of APWU. Notably absent was Jeff Johnson, president of the Washington State Labor Council who was scheduled to speak, but was forced to cancel due to an ultimatum from an unnamed head of a major union international. Johnson had received a threat that funding would be pulled from the labor council if he spoke. Johnson’ message was delivered to the crowd via proxy, yet this event highlights the immense pressures that labor leaders are under to buckle in their support for Bernie. The incident has since gone national with publications like Huffington Post picking up the story. The conservative role of many international leaders , has already had a serious impact on the Democratic Primary. While most of the rank-and-file leans toward Bernie, the weight of much of the trade union leadership has helped deliver close state caucuses to the corporate Hillary Clinton campaign, including Iowa and Nevada. The strategy of endorsing Wall Street candidates like Clinton (who pose as “friends of labor”) has already resulted in decades of defeats and betrayals. This has been combined with a general refusal to engage in serious struggle in the workplaces and on the street. It is two sides of the same coin. But importantly there has also been a rank-and-file rebellion, and many union activists and elected leaders are standing against the tide and for a much-needed political fightback for working people. Rank and file representatives of WFSE 1488 and AFT 1789 spoke out for Bernie at the event, both going against their international’s endorsements of Hillary Clinton and setting inspiring examples of how locals can resist the undemocratic endorsement process. 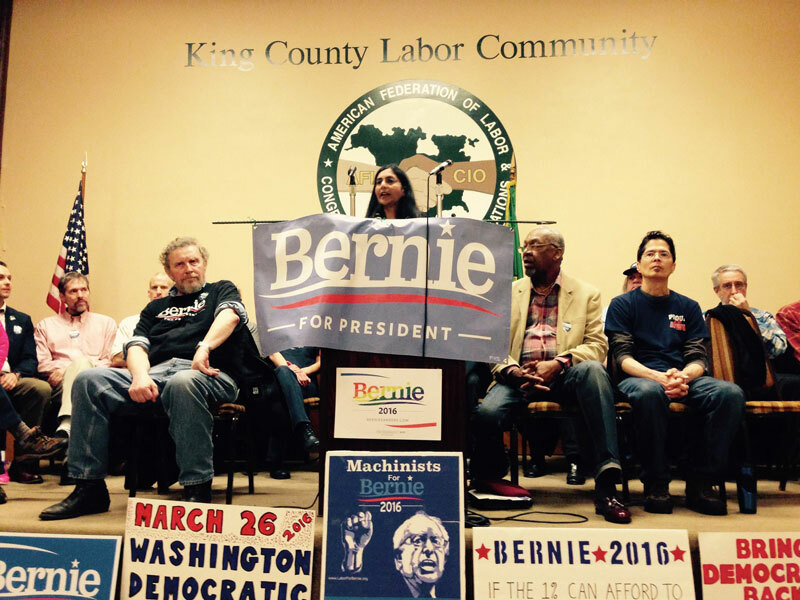 WA State Rep. Luis Moscoso highlighted Bernie Sanders’ program against institutional racism. Here in Washington State, he pointed out, the bar for convicting police who commit murders on the job is the highest of any state, making justice for families of police violence virtually impossible under the law. That same day there was another police killing of a black man, Che Taylor, this time in Seattle. As Seattle City Councilmember & AFT 1789 union member Kshama Sawant pointed out, elected officials “can’t serve working people and big business at the same time.” As working people are pushed to the brink around the world, they’re increasingly rejecting these burdens they’ve been forced to bear while the super-rich get even richer and more powerful. In the US that has taken the form of the Wisconsin uprising, Occupy, Black Lives Matter, the election and re-election of an open socialist in Seattle, the fight for 15, and now the Bernie Sanders campaign. When Kshama Sawant concluded, “we need to use the momentum from this year to begin building a new political party of the 99%,” the hall erupted into a standing ovation. The fight for a new party must be combined with rebuilding a fighting labor movement to challenge this system which puts the greed of the billionaires above the needs of the billions of working people, people of color, women and the poor. In a time of worldwide crushing austerity and while seeing the resistance in the rise of left politics, from Bernie Sanders in the USA to Jeremy Corbyn in England to Podemos in Spain, the working class is making their resistance known. However, we’ve seen time and again that international capital will crush those left-wing movements and governments that fail to present a real alternative to global capitalism based on the strength of working people. The pressure to capitulate is no more clearly seen than in the rise and failure of Syriza in Greece. The Labor for Bernie campaign has the potential to set in motion events that will go far beyond this one campaign. The rank-and-file rebellion for Bernie reveals a broader challenge to the strategy of tying labor to corporate Democrats and limiting itself to what’s acceptable to the corporate establishment. Rallies such as this one in Seattle should be put together in all major cities to strategize and build our movement. Union members whose internationals have endorsed Clinton should organize for their local to resist the pressure, They should call for a democratic discussion and vote over whether to back Bernie instead of Hillary Clinton, former Wal-Mart board member and NAFTA advocate. Bernie Sanders says himself that “no one president can take on the billionaire class alone.” It will take a movement of millions. A better world is possible, but only if we fight for it.